I recently received a new game to use in my speech room called Spingo. I have had a chance to use it with a few of my groups and I completely love it! 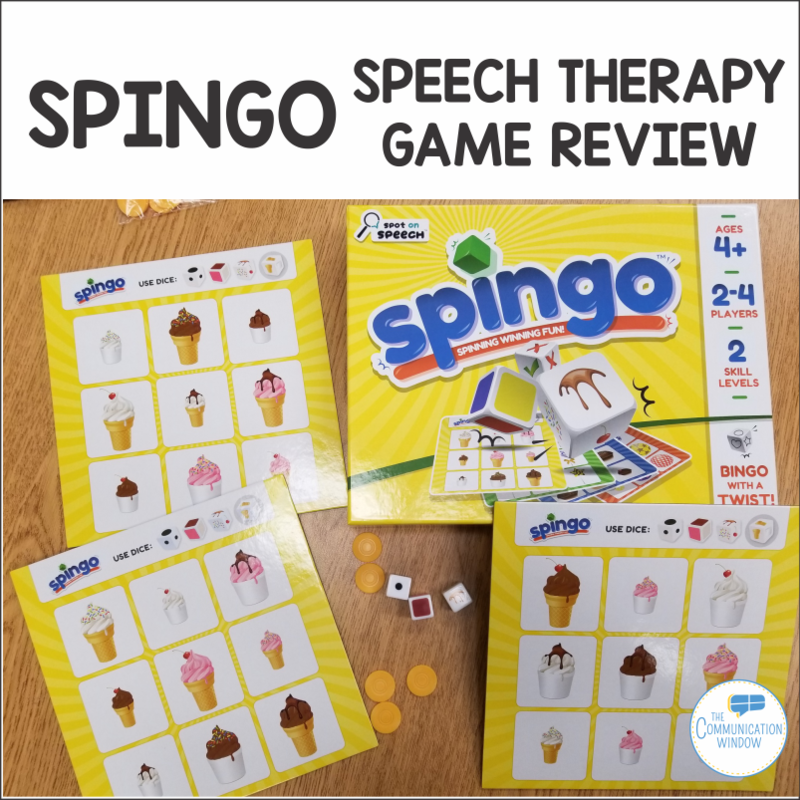 Spingo is a bingo style game that is awesome for children who are working on describing, expanding their sentences, and following directions. I used it with a group of 2nd and 3rd graders who begged to play it over and over again! My four year old also loved playing it. To play Spingo you choose one of the 4 themed playing boards – ice cream, cupcakes, lollipops, or balls. You then select the dice that go with that theme – you can choose to use 3 or 4 dice. Each player takes a turn rolling the dice. When you roll the dice you then describe what is showing so for the ice cream board you describe big/small, ice cream flavor, and topping. If you chose to use the 4th optional dice you would also describe whether the ice cream is in a cone or not. For example, in the picture above the player would describe “a small, chocolate ice cream with syrup on top.” The players would then all search their game board to see whether they have the ice cream described. Each of the themes are use a similar structure with some different dice combinations. I loved that I could easily scaffold the game by using more or less dice and I also wrote out sentence stems to help my students who needed a little more structure. My students were so engaged and the game can be easily used for a wide variety of language goals! 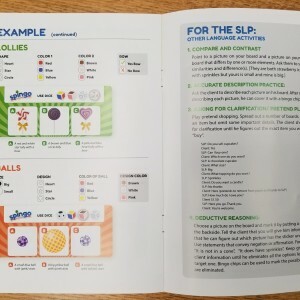 The instructions include even more ideas for using Spingo for a variety of speech and language development. I absolutely recommend this game for SLPs working with elementary age students or for anyone looking for a fun family game that would appeal to 4-8 year olds! The game is available on Amazon. Disclosure: I received a free copy of the game Spingo for review however all the opinions expressed are my own.